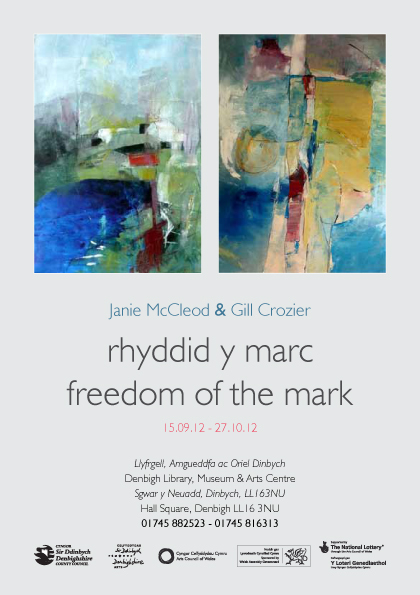 Coming up at Denbigh Library from 15th September until the end of October, Gill and Janie’s lovely works – not to be missed if you are in the area! Private View Friday 14th in Denbigh Library 6-8!!! I will be hanging the exhibition on the Thursday with help from DCC’s fab Arts Technician. All PV invites all 500 of them went out today and posters on on their way to all the Libraries and Main Buildings in DCC. Our new Arts Officer is now in post, Catrin M. Jones – I will be working in a handover situ for a little while longer!! Images already creating lots of interest. « THE BIG OCTOBER BASH! – support Hope House!